Palestinians said to be demanding release of 120 imprisoned terrorists, many with blood on their hands, as a condition for renewing peace negotiations • Habayit Hayehudi MK Orit Struck claims U.S. is exerting heavy pressure on Israel to release them. Israeli rightists say the Palestinians have demanded the release of 120 imprisoned terrorists, many with blood on their hands, as a condition for renewing peace negotiations with Israel. The terrorists were involved in attacks before the signing of the Oslo Accords in 1993. Habayit Hayehudi MK Orit Struck has submitted a parliamentary query on the matter, in which she claimed the U.S. government is exerting heavy pressure on the Israeli government to release these terrorists. On Monday, Almagor, a terror victims’ association led by Meir Indor, published a list of the terrorists supposedly under consideration for release. The list includes a terrorist who firebombed a bus in the Jericho area in 1988, killing Rachel Weiss, her three children and an Israeli soldier who tried to save them. Another terrorist on the list was responsible for a Jerusalem bus bombing in 1986. Indor told Israel Hayom on Monday that the Palestinians conditioning the resumption of the peace talks on the release of murderers revealed their true intentions. He noted that many terrorists released in the past later returned to terror activities, and said he feared this would happen again. Once again the PA (Palestinian Authority) is seeking to exact a price from Israel, a prerequisite to the resumption of diplomatic talks. PA officials are demanding the release of 120 terrorists imprisoned by Israel, including some with “blood on their hands” from their acts of murder, terrorists serving life sentences. MK (Bayit Yehudi) Orit Struk in her Knesset query posits the United States is applying pressure on Israel to approve the prisoner release. The Almagor terror victims association on Monday 12 Iyar 5773 released the names of the 120 slated for release. That list includes the terrorist who hurled the firebomb at a bus near Yericho which led to the deaths of Rochel Weiss and her three children as well as an IDF soldier HY”D. Also appearing on the list is the terrorist who in 1986 placed a bomb on an 18 bus that murdered six people HY”D and left others injured and maimed. While Prime Minister Binyamin Netanyahu has stated repeatedly Israel is willing to return to the negotiating table immediately, without preconditions, he has made so-called good-will gestures of this nature in the past. Maariv adds that Prime Minister Binyamin Netanyahu has rejected the Washington Plan again when it was recently presented by visiting US Secretary of State Johan Kerry. That plan calls for an international force headed by the USA stationed in PA areas. Israel fears the force will be incapable of preventing arms from being smuggled from Jordan into the PA state. Netanyahu speaks of an interim period of no less than forty years in which the IDF will maintain its position along the Jordanian border and Israel will not rely on an international force. One official is quoted by Maariv as adding the weapons smuggled in by Hamas may also be used against the PA in Ramallah and therefore the Israeli presence along the border is to the PA’s advantage too. An overwhelming 110 members of the Jordanian House of Representatives signed a petition demanding a pardon for a Jordanian soldier who shot and killed seven Israeli schoolgirls in 1997. Ahmad Musa Mustafa Daqamseh shot the girls during a school fieldtrip in Naharayim, near the Israel-Jordan border, and is currently serving a life sentence. Several days after the 1997 shooting, the late Jordanian King Hussein arrived in Israel for an unprecedented consolatory visit and together with Prime Minister Benjamin Netanyahu met with the bereaved families. “Your daughter is like my own. Your pain is mine,” the monarch said to one of the families as he knelt in their living room. He later visited one girl who was wounded in the attack in the Hadassah Hospital in Jerusalem. “I’m very sorry for what happened,” the king told her, and gave her a gift – a hamsa. 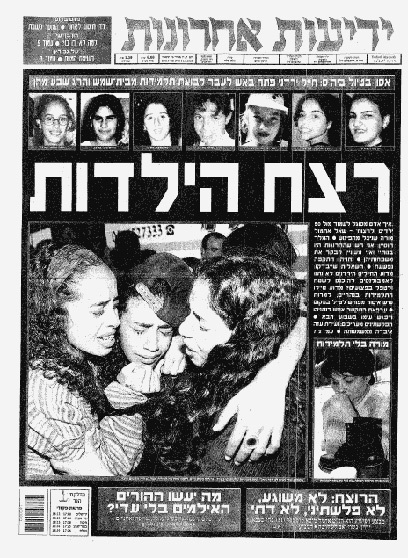 Following the shooting, the soldier’s testimony to his interrogators was released by Yedioth Ahronoth. “I don’t know what happened to me,” he said. “I lost control and acted.” The shooter, who claimed his actions were not prompted by anyone but himself, was sentenced to life in prison. Chairman of the Almagor Terror Victims Association Meir Indor stressed that “The Israeli government and the Knesset must exhibit determination regarding his pardoning, and must do so before Memorial Day as a moral obligation. Meir Indor is a lieutenant-colonel (ret.) in the IDF and head of the Almagor Terror Victims Association. 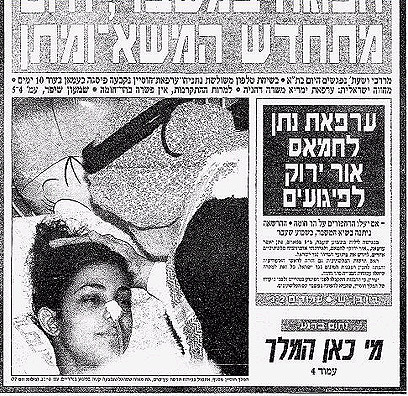 Amira Hass turned traitor long ago, and her case is one for the legal authorities. But is Hass the only journalist in the service of the “popular intifada”? What about the other news media—are they doing their job? The Palestinian Authority is the official body behind the recent “intifada” of rocks and Molotov cocktails, and Haaretz journalist Amira Hass has long been the Palestinians’ unofficial spokeswoman. When she wrote an article legitimizing rock throwing, she was doing her part in the PA’s effort to stretch a defensive umbrella over the young brutes lobbing rocks and incendiary bombs. They are the ones who mortally wounded baby Adelle Biton. They are the ones who seriously injured musician Itzik Kalah’s wife, Tziyona, four months ago near Beitar Ilit. Both events occured in the so-called settlements blocs: the Palestinians do not discriminate. The terrorist organizers don’t only deploy terrorists. They also deploy collaborators and lawyers, as well as sympathetic media coverage from within the civilian population under attack (in accordance with the doctrines of terrorism first developed in the Soviet Union). I don’t have any intention of taking on Amira Hass. She turned traitor long ago, and her case is one for the legal authorities. But is Hass the only journalist in the service of the “popular intifada”? What about the other news media—are they doing their job? Or are they also collaborating, by keeping silent? Most of the media do not report most rock-throwing attacks. I encountered this reality in the past when my wife and I were nearly lynched on our way home from visiting my parents’ graves on the Mount of Olives. Only a few of the media reported on the injury to my head, even though pictures were provided to them on a silver platter. No journalist except Arutz Sheva came to interview me about what I had experienced, about the feeling of helplessness that comes with the inability to protect one’s wife. There was my wife’s angle too. She was the one at the wheel. Aside from the fear and the terror, the trembling and the tears that gripped her, the post-traumatic symptoms, she was left with a sense of betrayal. My wife is a nurse, and she has occasion to provide treatment to residents of the Arab neighborhood where we were attacked, while virtually all the teachers from the little terrorists’ school stood outside watching as their students set upon us. Fittingly or not, the principal brought his daughter to be treated by my wife just one week later. Then there is my daughter the journalist, who hurried to the scene only to discover that this was the same school about which she had published a number of complimentary news items. And I have to make mention of the two times when I personally rescued Arabs who found themselves in the midst of angry crowds gathered for funerals of terror victims. Yet none of the Palestinians in the dozens of vehicles around us on the Mount of Olives made a move to save us. What we have here is a perfect scoop by any measure. But almost nothing was published. So when did the mainstream media report on what was happening in the area? Just one day after I was wounded, when City of David head David Be’eri lightly injured an Arab youth who was throwing rocks at his car as he drove through the area. The footage taken by the photographers who had been invited to film the Palestinian ambush, showing the youth being injured by Be’eri’s car, was broadcast repatedly. Why does this matter so much to me? Because even aside from the media’s rightful function of delegitimizing terrorism with cold weapons, coverage makes a difference. A big difference. In a country where the media are so powerful that they dictate how many resources go to a given criminal investigation, reports carry a lot of weight. When rocks were thrown at an Arab woman last month in Jerusalem, media pressure brought out a slew of investigative teams, and all those who had been involved were quickly arrested. The powers that be made it crystal clear that the law is supreme, and it is enforced … the problem being that it is enforced selectively. Here is a different angle on the same issue: in the absence of media reports to the contrary, Barack Obama could sell the PA to the Israeli public as a an entity with which it is possible to make peace. Due to the lack of media coverage, warped orders are issued every day for dealing with the dozens of cases in which Israelis are ambushed with rocks and Molotov cocktails. 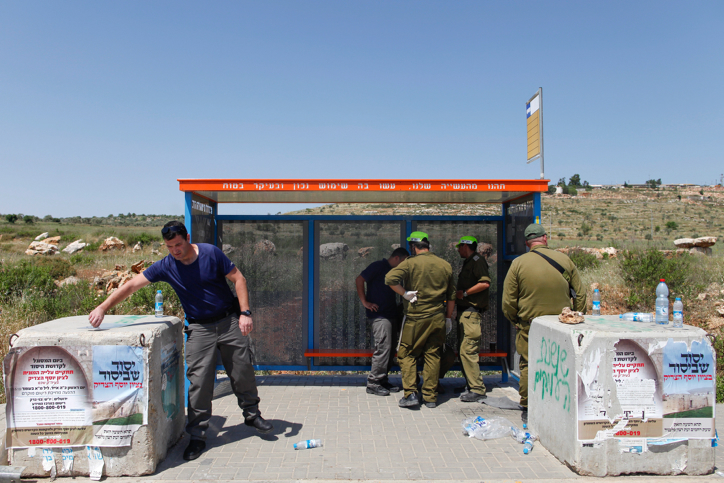 In the current reality, shifts of reservists and enlisted soldiers on security duty in Judea and Samaria are competing to see who can manage to do the job without casualties … on the Palestinian side. The senior commanders brag about the prowess with which apply the doctrines of low-intensity warfare. The platoons are praised in debriefings for operating wisely. The line “restraint is also a kind of power” (first uttered by Arik Sharon, while visiting wounded terror victims) has become a military mantra. Despite all the bad experience with restraint as defense policy, we are going in that direction yet again. The combination of the media’s indifference to the wounding of Jews and senior IDF officers’ instructions to exercise restraint in the face of Palestinian terrorism is interpreted by those organizing the attacks as a blank check to keep them coming. Once it was small groups of terrorists with their faces covered who threw rocks at IDF forces. Now it is in the open, often with masses of attackers, who know that nothing will happen to them as long as no Israeli is dead yet by the end of the event. This is a fact. How many of the people who participate in these rock-throwing demonstrations have been arrested, after being photographed and filmed while there? The IDF could go into their towns at night and collect them by the hundred. But in practice very, very few are apprehended. The Palestinians take advantage of this. Intelligently, craftily, they put youths and minors to work on the rock-throwing front, knowing that they are protected by Israeli and foreign NGO’s—as well as the Israeli media, which rush to the scene the moment an investigator strays from his orders while trying to extract vital information or a confession. Welcome to the paradise of Palestinian terrorism. All together, this is the route to the legitimization of terrorism. It starts with Amira Hass, and it ends with the killing of the Palmer father and son by a well-aimed rock thrown from a moving vehicle. For Hass, this is a legitimate deed. For me it is a legitimate reason to put her in jail under the Prevention of Terror Ordinance for encouraging and collaborating with acts of terrorism.